Back cover blurb: There are three sides to every story... 2019: Julianne is preparing a family dinner when her son comes to her and says he’s found something on his iPad. Something so terrible, it will turn Julianne’s world into a nightmare and make her question everything about her marriage and what type of man her husband is or is pretending to be. 1990: Sophie is a fresher student at Oxford University. Out of her depth and nervous about her surroundings, she falls into an uneasy friendship with a group of older students from the upper echelons of society and begins to develop feelings for one in particular. He’s confident, quiet, attractive and seems to like her too. But as the year progresses, her friends’ behaviour grows steadily more disconcerting and Sophie begins to realise she might just be a disposable pawn in a very sinister game. A devastating secret has simmered beneath the surface for over twenty-five years. Now it’s time to discover the truth. But what if you’re afraid of what you might find? 2019 : Julianne is about to throw a dinner party when her teenage son, Stephen comes to her, horrified at some content he has come across on his iPad. Something so terrible, that he cannot even articulate it. Something about her husband and her son's Father; James that will turn their world upside down forever. 1990: Sophie is a fresher at prestigious Oxford University when she meets Ally, Ernest, Peter and James. Despite her obvious intelligence, she is immediately out of her depth, younger and from a poorer family, she doesn't immediately fit in. Told from alternating viewpoints; Julianne's in 2019 and Sophie's in 1990, it is apparent that the two narratives are somehow linked, but it is not clear how. Both women are suffering in their own way, and it is hard not to feel some sympathy for them, though neither woman is particularly likeable. 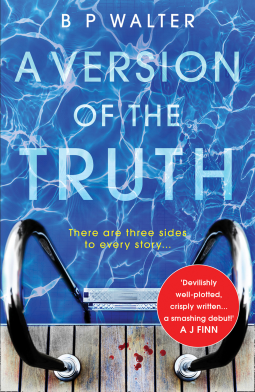 A Version of the Truth is available from 7 February 2019.